Hold onto your decks, it’s a Hearthstone balance update! This one is due out today, earlier than usual, with Blizzard changing five cards with the intention of improving both Standard and Wild modes. Pay attention, Druids, because the first two changes affect you. Both Wild Growth and Nourish have had their mana costs increased by one, bumping them to three and six, respectively. They’re too powerful, says, Blizzard, and it’s a bit boring when they feature in everyone’s deck and get used constantly. With the change, you might want to add them to your late-game control druid deck, but unless you’ve built your deck around grabbing more mana, they’ll feature less prominently. Level Up is also getting a price hike, this time for five to six. Blizzard wants to remove it from the Odd Paladin deck. It’s a powerful deck that first cropped up with the Witchwood expansion, covering the board in minions. 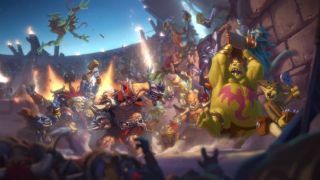 With Level Up out, Blizzard says it will still be a competitive control deck, but its damage output will be easier for opponents to deal with. Shamans using the Shudderwock deck might be a bit disappointed to discover that they won’t be able to spawn an army of Shudderwocks anymore. The Saronite Chain Gang’s battlecry now specifies that it summons another Saronite Chain Gang instead of summoning a copy of “this minion”. When you use Shudderwock to copy the card’s battlecry, then, you won’t get another Shudderwock. Rogue’s Leeching Poison’s been defanged, too. While its cost has been reduced from two mana to one, it no longer gives your weapon permanent Lifesteal, instead you get it for one turn. Blizzard says it went against the studio’s philosophy of not giving the class a persistent self-heal, and it made the Kingsbane Rogue deck too powerful. And that’s your lot! Some pretty big changes for a few decks. Have they ruined your plans? The update will be available soon, and you can read the patch notes here. If you're just getting into Rastakhan's Rumble, here are the 10 most exciting cards from the latest expansion.